Seattle architects HyBrid Architecture did it again with this design, which like their others uses shipping containers to make an efficient but attractive living space. The owner of a small urban lot asked the firm to design a building that could house four apartments sitting over two retail spaces – the catch was that the client asked for a building that could be easily relocated, tenants and all, within a week’s time. 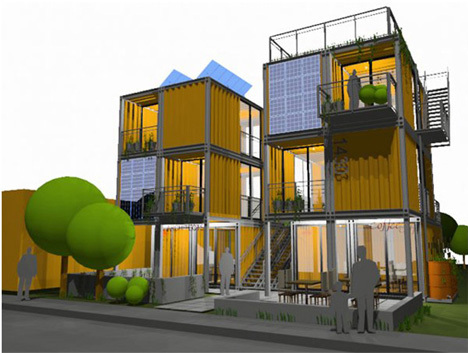 Shipping container architecture is perfect for this purpose, since the containers are sturdy enough to be moved around whenever needed.